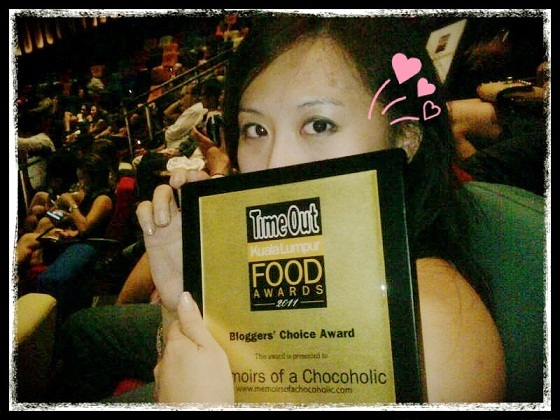 Memoirs of a Chocoholic: I Won? It's hazy, but I vaguely remember the initial announcement going completely over my head as I stood with the other shortlisted bloggers on the KLPAC stage, then finally hearing it, looking like a deer in headlights then doing a really embarassingly undignified jump-jump-jump on the stage as it started setting in that I won. If I had to try to sum it up, I am: Happy, shocked, gleeful, nervous, flattered, flustered, proud, unsure. - everyone who voted for me, whether they liked my post(?) or just love Village Park as much as I do. - Village Park! For consistently serving up my favourite nasi lemak all these years! seriously wanted to try village park until i was barred from spicy delights. What?? U. Me. Nasi lemak at village park. ASAP. BRAVO! So well deserved :-) Great job, J!! Congratz !!!! way to go girl ! Let's celebrate with some more macaroons! So when are we going to sample this nasi lemak together? joaquim!! kudos on your tokl win!! 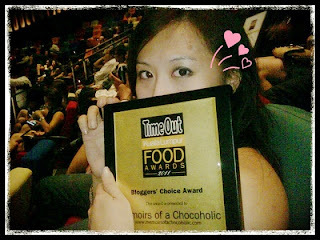 super delighted for you... and yes village park is my fave nasi lemak too :) brilliant job..!